Fine coffee and delicious home baked goods are not the only thing on offer at The Split Screen Coffee Company but they’re a good start. 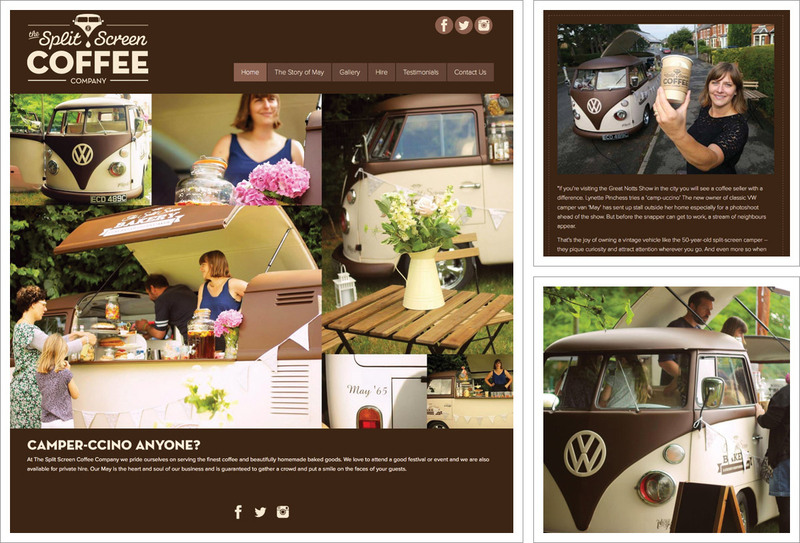 Visit their website and you will be enveloped in a warm welcome, rich coffee and cream colours to match in with May, a 1965 classic VW Campervan which has been converted to a split-screen mobile cafe. The website is a responsive design which means it works well on desktop computers, tablets and mobile phones. The horizontal menu and widescreen layout allow for a high impact changing image banner on the homepage perfect for showing inspirational photos of May in action. Key pages include Home, The Story of May, Gallery, Hire, Testimonials and Contact Us which is a secure online contact form. The Gallery contains more images of May displayed in a lightbox and these are also shared on social media. May makes good use of Social Media pages including Facebook, Twitter and Instagram to tout her wares and whereabouts at festivals, events and she’s also available for private hire. Read more about The Split Screen Coffee Company on our Web Design Blog.